Did Anselm of Cantebury prove God's existence? It’s the biggest question of our life. Does God exist? If He does, it changes everything. 1. Belief in God seems irrational (atheism). 2. God’s existence is unlikely (agnosticism). 4. Fear of accountability. If God is real, the way we live our life matters more than ever, and we may have to make changes in it. Let me dwell on #1 for a minute. God reveals Himself to us through reason, through the natural world. If you tend to be left-brained, that is, analytical and logical, you may find the “ontological” argument for God’s existence of interest. This approach uses reason and intuition alone to prove the existence of an all-powerful Creator. The originator of this ontological argument is St. Anselm, the Archibishop of Cantebury in the 10th and 11th centuries. He was proclaimed a Doctor of the Church in 1720 by Pope Clement XI because of the significance of his contributions to the study of theology. 1. That than which nothing greater can be thought can be thought. 2. If that than which nothing greater can be thought can be thought, it exists in reality. 3. Therefore, that than which nothing greater can be thought exists in reality. 1. If I am thinking of the Greatest Being Thinkable, then I can think of no being greater. 1a. If it is false that I can think of no being greater, it is false I am thinking of the Greatest Being Thinkable. 2. Being is greater than not being. 3. If the being I am thinking of does not exist, then it is false that I can think of no being greater. 4. If the being I am thinking of does not exist, then it is false that I am thinking of the Greatest Being Thinkable. Conclusion: If I am thinking of the Greatest Being Thinkable, then I am thinking of a being that exists. An interesting philosophical puzzle, isn’t it? 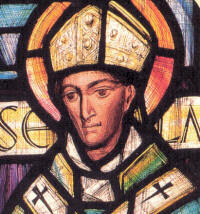 What do you think about St. Anselm’s proof? Are there any flaws in his reasoning? Should we discriminate on the basis of religious orientation? Let’s see – I’m thinking of the largest infinite number, so there can be no larger infinite number mumble mumble. While I’m at it, I’ll also think of a square circle. I think a lot of people drift away from God out of boredom or frustration. There is little room in faith for the imagination, and yet but the very idea of faith relies on it.